Call us selfish, self-absorbed or whatever you wish, my husband and I are “DINKS” – dual income with no kids. We happen to love children, but our paths in life just didn’t take us in that direction. So now what do we do? Headed for the golden years of retirement being childfree is not the way it was meant to be, I suppose. Consider the benefits of having children as you get older. They can take care of you in your old age. They continue the family lineage and could make you a grandparent one day. They can be a source of joy and companionship (on the good days) and provide parents with a reason to live, make plans and care for somebody other than themselves. That is a very simplistic view of having children. Most every parent I know has spent a lifetime loving, caring for and providing for their children without the thought of building children into their plans for retirement and old age. There’s no denying that retiring and dying alone, unloved and unwanted with no one to care for you is a frightening thought. However, it is possible to build another untraditional type of extended family, without actually having your own children. Some people advise that many seniors – particularly those who are single – should consider a shared living arrangement. An article by CARP – Canadian Association of Retired Persons—talks about the virtues of alternate accommodation in “Retiring with roommates: The merits of shared living as you age”. Shared living arrangements help cut down on expenses in retirement when most people are on fixed incomes. They also help to address the social isolation that many people feel in old age with no one around. Another way of “extending family” and social contacts in retirement that I have been thinking about lately is volunteering my time. The Globe and Mail article “How do I volunteer my retirement years so I truly make a difference?” outlines that while seniors contribute the most average volunteer hours of any age group (more than 200 a year), only 36 per cent of seniors (based on 2007 data) volunteer, compared to almost 50 per cent of other Canadians. Not knowing how and where to contribute skills and experience may certainly be a factor. The article provides prospective volunteers with an idea of organizations that would like to hear from them. Foster Parenting: The Children’s Aid Society of Toronto (CAS), for example, states that “There are children in the community who need you! You can be the difference for a child in need by opening your home as a foster family.” While the CAS strives to keep children with their own families, sometimes this is not possible because the parents are not able to provide adequate care for their children. Foster care is an alternative for these children. Information about the child is provided to the prospective foster care givers, as well as training before a child is ever brought into the home. With National Volunteer Week 2016 running from April 10 to 16, it’s timely to begin thinking about how to contribute your skills, talents and enthusiasm in a volunteer effort that will benefit the community and, in turn, make your retirement years meaningful, enjoyable and less lonely. After running a small kitchenware store for more than 25 years, my husband Didier is being forced into retirement. His store and other shops along an entire block have been sold to a developer who plans to tear them down to build one of those retail/condo monoliths that are sprouting up everywhere. Could my husband move his business to another location? I suppose, but he’s 62, so the prospect of closing shop and re-opening elsewhere at this stage of his life isn’t appealing to him. That means that my husband and I will soon be a mixed-retirement couple. While I will continue working for many more years to come, in a few months Didier will be facing sudden retirement. This is causing us some stress, as we are beginning to realize that there are pitfalls to our situation. Why? How will Didier fill his days while I am not around? What will he do for social supports/networks? Can we rely on one income? Will he grow to resent me for not spending more time with him or for being the “breadwinner”? Will I resent him for being able to enjoy a leisurely coffee in the morning when I have to race out the door to work? Will his feeling of self-worth be affected if he has a difficult time creating a new identity for himself beyond that of work? Apparently, according to Statistics Canada, today only about half of the couples approaching retirement intend to retire at the same time. 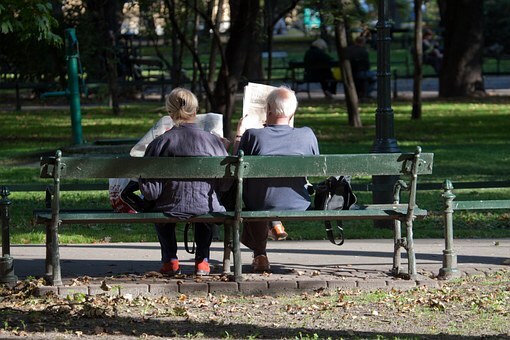 A growing disjointedness of spousal retirement is attributable to the declining proportions of husbands and wives retiring two to four years after their spouse and the increasing proportions retiring five or more years after each other. Furthermore, Statistics Canada found that most women retire after their husbands. Talking is important: We frequently talk about the vision each of us has for how life will unfold once one of us is retired. Money: It’s clear that I will be the remaining wage earner and I generally look after our future financial/retirement affairs. However, my husband is the expert in making every dollar stretch further – so each of us has an important role to play in ensuring that we can live off the one salary. Household duties: This is not really an issue, since Didier already does the majority of cooking, considers me his “apprentice” in the kitchen and really takes pleasure in maintaining the home. A traditional role reversal? Well, I guess so, but it works for us. Travel: We’ve decided on taking one to two trips a year until I take the retirement plunge and then we may be spending time as Snowbirds in Florida for about half the year. spend more time taking care of his elderly mother? become more physically fit by starting up his exercise routine again? get a part-time job that doesn’t eat into his evenings and weekends like his store did? Many people say that couples who retire together find that constant togetherness can be overwhelming. At least by staggering our retirement starts, we hope to transition into retirement life and learn from each other.